I thought I saw a thread about this last year. I searched by address, adjacent street name, and the convenience store, but I saw nothing. If this is a duplicate, please merge mods. The property at Bissonnet and Shepherd, 2132 Bissonnet, will be demo'd. The land at the northeast corner of Shepherd Dr. and Bissonnet St. (not far down the street from closing-this-weekend Kay’s Lounge) has been sold to an entity using the La Porte corporate address of traditionally freeway-hugging Gringo’s Mexican Kitchen. What's replacing the convenient store at 2132 Bissonnet. Boutique new construction, mixed-use development designed by Michael Hsu Office of Architecture and developed by the Platform Investment Group, LLC, is now leasing office space on the second and third floors. The space features quality design, high ceilings, exposed structure, expansive views of surrounding treescape, and access to exterior balconies. Ground floor will have an all-day cafe. Leasing and building information on the new 2132 Bissonnet development. Vehicular access from both Shepherd Drive and Bissonnet Street. The second floor can be occupied by a single tenant or is easily divisible into two suites. This level has access to a planted balcony along Shepherd Drive and expansive windows looking into the surrounding tree canopy. The third floor can be occupied by a single tenant or is easily divisible into two suites. This level has access to a balcony overlooking Bissonnet Street and expansive windows overlooking the surrounding tree canopy. 2132 Bissonnet is an 11,500 sf ground-up mixed-use development in the Boulevard Oaks neighborhood of Houston. Set to open in late 2018, the building is located at Shepherd Drive and Bissonnet Street, the site of a former gas station and convenience store. The development will feature an all-day cafe on the ground floor and two floors of boutique office space above. A representative of the Platform Group, the building’s developer, tells Swamplot an “all-day cafe/coffee shop” is being planned for the ground floor, and that the upper 2 floors will contain “boutique office space.” The cafe won’t be a Gringo’s Tex-Mex, but the developers do have a connection to that restaurant chain: The Platform Group is headed by a son and daughter-in-law of Gringo’s owner Russell Ybarra. Set to open in 2018, this corner cafe will offer coffee, drinks, and a diverse all-day menu. 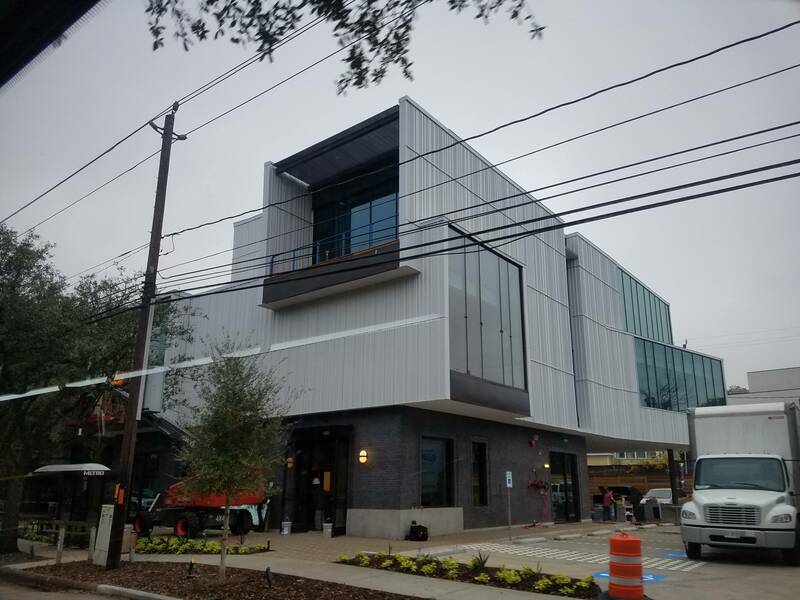 The concept draws inspiration from the lush tree canopy and landscaping of the surrounding historic neighborhood as well as Houston’s rich Latin food culture. The restaurant will include approximately 55 interior and 35 outdoor seats, a full kitchen, and featured coffee and bar areas. Glad to see that it's situated close to the streets, and that the developer thoughtfully included that it's accessible by bicycle and METRO. Parking will be a nightmare. Wouldn't that be ideal? Except not everyone who would have a need to go here for work (the offices being built here) or pleasure (the cafe and coffee shop) live close enough to bike, or take a bus there. Taking a Metro bus would take anywhere from an hour or two to three hours to get there depending on if there is a bus stop near someone's neighborhood (suburbs included), or depending on where they live (west Houston, east Houston, southwest Houston, southeast Houston, north Houston, and so on). So how would biking or taking the bus there be an option for people who want to go here? C'mon now. This is why Houston needs to invest in better public transportation like sky rail and light rail that connects all parts of Houston to major city centers. This is why there is a need for Houston or an etrepenuer to consider building parking structures that hold a high volume of vehicles every few blocks in high traffic commercial areas. People could park there and walk the couple or several blocks to whatever business or retail they needed to go. The high volume parking garages would accommodate people who travel from other parts of Houston and the suburbs, and decrease parking in neighborhoods with narrow street or that have signs prohibiting parking, that limit parking in those areas. My comment was supposed to be a little tongue in cheek, but this right there is what we need. We need more infrastructure in what we want to be walkable areas to actually make them walkable. We need garages to park in that can replace surface lots, and we need public transit that cuts travel times to no more than 30 minutes for most areas inside the loop. I live a few blocks away. As an inside the Looper, I take great offense to this being in the Uptown/Galleria section. Ha, I wondered about that as well. It really should be in the "Museum District" section. Take your offense up with the forum's admin. I posted it here because though it's close to Montrose, The Museum District, Upper Kirby, Bellaire, it's not in any of those neighborhoods. It's more West U, close to the West Loop. AND THERE IS NOT A FORUM DESIGNATED FOR WEST U, Rice, and Bellaire as there needs to be. There is also a need for a Third Ward forum, a forum for southwest Houston that would include the NRG area, and more. There has been support for a West U, Rice forum as far as 2007, the admin won't create one for it and other areas. Topics like this are posted in other threads where a specific forum for it, such as West U, would fit better, or are regulated to the catch all forum, Other Neighborhoods. I've started putting the neighborhood name first then the address/development for topics that don't have a forum. It was a joke. Please take a chill pill. The "coffee cafe" mentioned above is going to Cavo and Cleo Roasting? 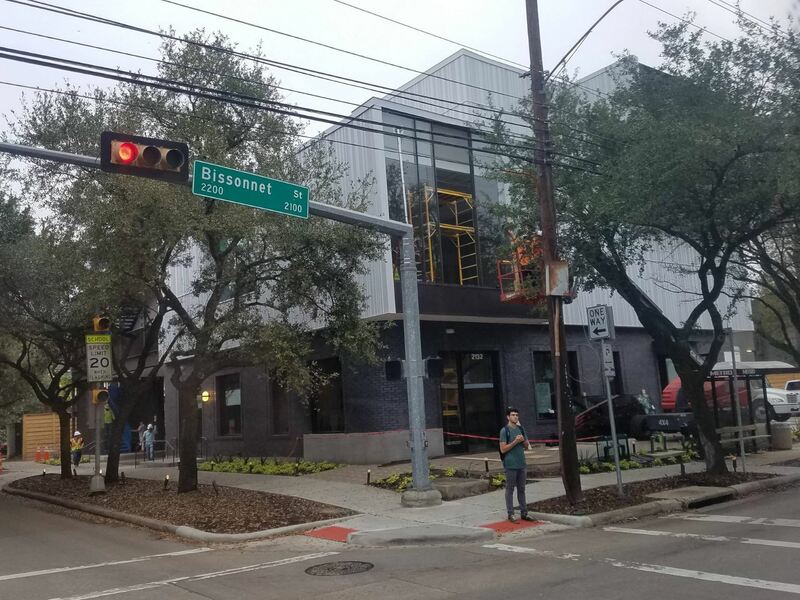 Upper Kirby caffeine destination Cavo Coffee is opening a second location at 2132 Bissonnet Street, within a newly revamped co-working space called Local Office, reports Swamplot. In a doubly exciting move, the coffee shop will be opening its own bean operations, Cleo Roasting Company, next door to its new West U space. That Eater article is incorrect. The Cavo/Cleo combo is down the road at 2617 Bissonnet. 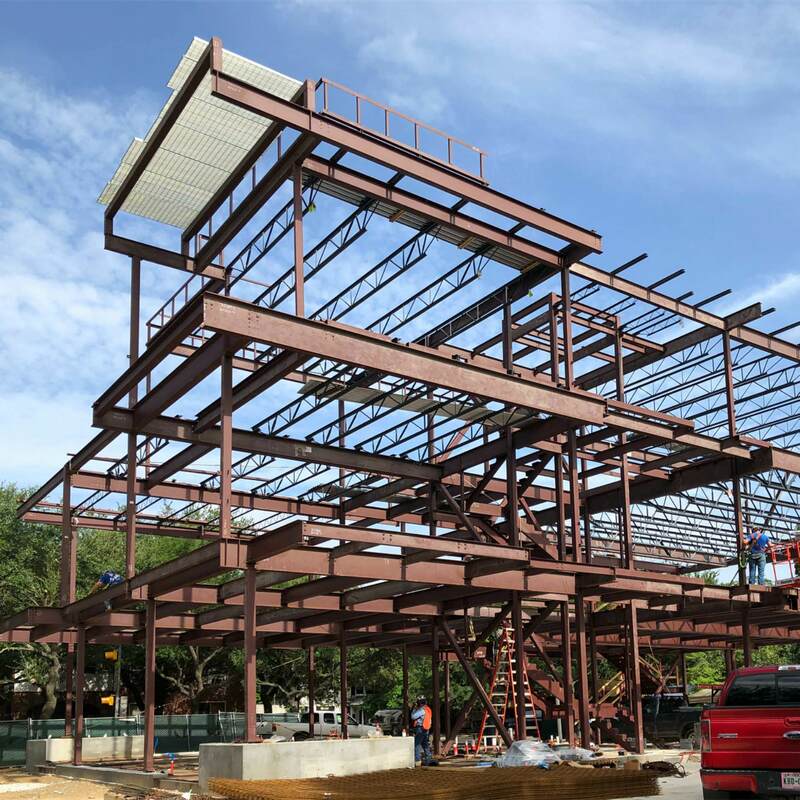 Construction progress from July of 2132 Bissonnet in Houston. This new building is an improvement over the convenience store before it. The store always looked out of place to me. This blends in better with the neighborhood. I still need to take an updated photo of this, because exterior construction is virtually complete, but I saw there is now a TABC permit application sign on a first floor window. No THAT is good infill!!!!! One of my favorite small building infills this build cycle. Interesting play with materials, like how it uses the forms to frame views, and it sits on this site as best as one could have done it given the restrictions. ...The 11,500-square-foot building replaced a convenience store and one-time gas station that had occupied the 15,500-square-foot site for decades. ...Later this year, the Ybarras, both 35, plan to move Platform's offices to the third floor of the Bissonnet building. Update on 2132 Bissonnet from Houston Chronicle today. Cafe is named Tropicales or Tropicales Cafe y Comida .